This morning the Popular Movement of Beit Ommar in conjunction with international and Israeli activists marched under harsh weather conditions to the nearby Israeli colony of Carme Zur. They were immediately confronted by Israeli soldiers who were guarding the illegal colony. The Israeli occupation soldiers launched sound grenades on the peaceful protestors who were walking towards the colony while holding signs. The heavily armed soldiers who greatly outnumbered the protestors ruthlessly yelled at the protestors and pushed them violently. The protestors did not go back, despite the demand made by the occupying forces. The occupation soldiers then went on to follow and encircle the protestors while intimidating them. Nevertheless, the protestors did not yield to the threats and continued to walk along the so-called `security` fence surrounding the colony while demanding freedom for Palestine, an end to the illegal colonization and opposing the Apartheid Wall which cuts off millions of Palestinians from water, agricultural fields and their historical homeland. The heavily armed soldiers took pictures of the diverse group of protestors and pushed them. heavily armed occupation soldiers, the protestors did not leave the area and chanted ‘Free Free Palestine’ as well as other slogans. Yousef Abu Maria, secretary of the Popular Movement, also attended the protest. Earlier this week on Wednesday (2.1.2013) at 2 AM in the morning, occupation soldiers burst into the home of Yousef, awoken him and his family and arrested him. He was charged with participating in a protest against the illegal occupation of Palestine, a protest which took place six months ago, in July 2012. Yousef was released after paying a 1,000 NIS fine. Yousef was also warned that he is barred from entering the lands of Beit Omar in which Karme Tzur currently lies. 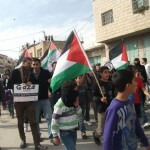 Despite this warning by the occupation authorities, Yousef insisted on participating in the event and marched on despite the risk that this posed for him. This entry was posted in Campaign, Events, Israeli Settlers & Settlements, Occupation and tagged Demo, IDF, Occupation, settlements, West Bank. Bookmark the permalink.